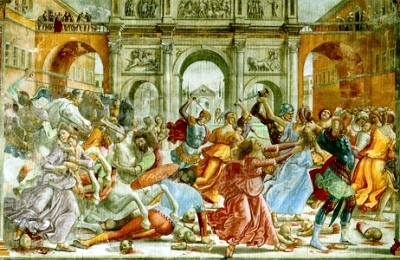 It is impossible to determine the day or the year of the death of the Holy Innocents, since the chronology of the birth of Christ and the subsequent Biblical events is most uncertain. All we know is that the infants were slaughtered within two years following the apparition of the star to the Wise Men (Belser, in the T�bingen "Quartalschrift", 1890, p. 361). The Church venerates these children as martyrs (flores martyrum); they are the first buds of the Church killed by the frost of persecution; they died not only for Christ, but in his stead (St. Aug., "Sermo 10us de sanctis"). In connection with them the Apostle recalls the words of the Prophet Jeremias (xxxi, 15) speaking of the lamentation of Rachel. At Rama is the tomb of Rachel, representative of the ancestresses of Israel. There the remnants of the nation were gathered to be led into captivity. As Rachel, after the fall of Jerusalem, from her tomb wept for the sons of Ephraim, so she now weeps again for the men children of Bethlehem. The ruin of her people, led away to Babylon, is only a type of the ruin which menaces her children now, when the Messias is to be murdered and is compelled to flee from the midst of His own nation to escape from the sword of the apparitor. The lamentation of Rachel after the fall of Jerusalem receives its eminent completion at the sight of the downfall of her people, ushered in by the slaughter of her children and the banishment of the Messias.